Pressing in place the latest piece in the 2012 IZOD INDYCAR Series puzzle for team complexions, the KV Racing Technology team formally contracted with Chevrolet engines. In a news release dated November 1st, team co-owner Kevin Kalkhoven stated “Chevy has a proven history of innovation and success in motorsports and we look forward to continuing that legacy.” Jimmy Vasser, the other significant part of the KV Racing Technology organization, spoke delightly on the powerplant choice. “I am very excited Chevrolet is returning to IndyCar racing and that we will have the opportunity to work with them. I have a long personal history with Chevrolet. My first car was a 1969 Camaro, my first podium was with a Chevy engine in 1993 at Phoenix and, I am proud to say, that I am a Chevy dealer. We look forward to a very successful relationship with Chevrolet for many years to come.” Vasser said. 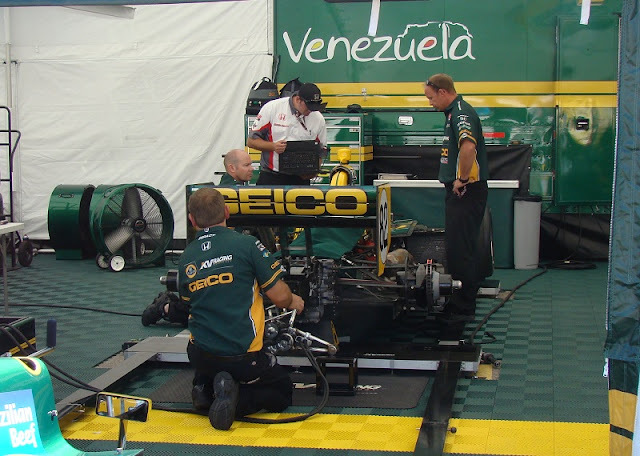 Collecting four poles in the past 2011 season, KV Racing Technology had been a most improved team on the racing circuit thanks to the additional of Brazilian veteran Tony Kanaan and the maturing of the second-year driver Takuma Sato and EJ Viso. Though winless in the 2011 IZOD INDYCAR Series, the team concluded the year with a best finish of 2nd place by Kanaan at Iowa Speedway. While all team competed with the spec Honda Racing Development V-8 engine, the 2012 season will be the first time KV Racing Technology will be powered by another engine supplier. The KV Racing Technology's team engine choice resolves one unanswered question involving the race organization but opens to door for several more inquires. Electing to be powered by the Bowtie brand, the team's relationship with Group Lotus appears to be reaching an impasse. Will Group Lotus continue to associate with KV Racing Technology in the 2012 IZOD INDYCAR Series? If not, could Lotus be taking their support to other team? With reports that the Lotus INDYCAR Series powerplant will be ready for the 2012 season, the presence of the promised Lotus V-6 engine is yet to be completely confirmed. Being created in partnership with John Judd's Engine Developments Limited, only HVM Racing has formally admitted they are competing with the powerplant. The announcement of Chevrolet engines could also lead to questions on the driver line-up situation for the 2012 IZOD INDYCAR Series. Will long-time Honda pilot Takuma Sato leave the team in favour for one powered the Japanese auto brand? Tony Kanaan has also been a long-time Honda driver since the 2001 CART World Series driving for Mo Nunn Racing. However, Kanaan does has a one-race outing at the 2002 Indianapolis 500 with Chevrolet power. KV Racing Technology will likely want to maintain their three-car operation into the new season. The latest major team establishing their 2012 engine choice, KV Racing Technology joins Penske Racing, Panther Racing and Andretti Autosport in opting for the Ilmor-designed Chevrolet powerplant. Significant teams left unattached to 2012 engine plans remains the Dreyer & Reinbold Racing as well as Newman/Haas Racing.